The First International Food Safety Conference, hosted jointly by the Food and Agriculture Organization of the United Nations (FAO), the World Health Organization (WHO) and the African Union (AU), will bring together government leaders, senior policy makers, and representatives from international organizations, civil society and the private sector, to identify key actions and strategies to address current and future challenges to food safety globally; and to strengthen commitment at the highest political level to scale up food safety in the 2030 Agenda for Sustainable Development. Some of the key issues to be addressed include the benefits of investing in safe food; safe and sustainable food systems in the context of a changing climate; science, innovation and digital transformations for food safety; and empowering consumers to make healthy choices and support sustainable food systems. Conference speakers are scheduled to include the President of Egypt Abdel Fattah el-Sisi (incoming African Union chairman), President of Rwanda Paul Kagame (outgoing African Union chairman), Prime Minister Abiy Ahmed of Ethiopia, African Union Commission Chairperson Moussa Faki Mahamat, President of the African Development Bank Akinwumi Adesina, FAO Director-General Jose Graziano da Silva and WHO Director-General Dr Tedros Adhanom Ghebreyesus. Heads of state and government, ministers from health, agriculture, trade, environment and other sectors, plus leaders of international organizations, research and academia, civil society and the private sector, are expected to attend. The event is expected to adopt a high-level political statement advocating for increased and better coordinated collaboration, technical support and investment to improve food safety globally. Accredited journalists can attend all Conference sessions and access the onsite press centre. A press conference will be held on 12 February following the opening session. High-level national and international officials will be taking part. In addition, interviews can be arranged with officials and experts attending the conference. Media must be accredited to attend the Conference. The deadline for accreditation is 7 February 2019. 1. Click here https://reg.unog.ch/event/28117/ to open registration form (use Google Chrome, Firefox or Microsoft Edge). 2. Create an INDICO account (if you already have one, you can skip this step). 3. Complete the conference registration form by clicking on Register now. Please note: you must upload a personal photograph, your passport number and passport expiry date. In most West African countries, groundnut is an important crop used in various forms. It is a basic food and cash crop. Its production, processing, and trade are major sources of employment, income and foreign exchange in many West African countries. Unfortunately, since the 1960s, groundnut production and trade have been declining due to various factors; aflatoxin contamination being an important cause of this decline. Many countries in the region would unleash their groundnut sector’s potential if they could effectively tackle the aflatoxin menace. In an attempt to address the problem faced by West African states and bringing potential solutions, PACA organized a workshop on “Revamping the groundnut value chain of West Africa through aflatoxin mitigation”. Identify new, and strengthen existing partnership opportunities among national, regional and international stakeholders in aflatoxin management and agree on strategies for mobilizing required investments to support priority activities. The workshop was held in Dakar, Senegal from 01-02 September 2015. The workshop was jointly organized by PACA Secretariat, Economic Community of West African States (ECOWAS), International Institute of Tropical Agriculture, International Crop Research Institute for the Semi-Arid Tropics, Pan African Agribusiness and Agro-Industry Consortium, Bill and Melinda Gates Foundation, United States Agency for International Development, West and Central African Council for Agricultural Research and Development (CORAF), the Government of Senegal and other partners. Watch PAEPARD interviews with participants: Dr. Janet Edeme, Head Rural Economy Divison, African Union Commission, and Papa Ousseynou SANE, C.E.O Snambel Production et Distribution. One of PACA’s main roles identified within its Strategy 2013-2022, is to act as an information clearing house. PACA is therefore developing an electronic aflatoxin data management system that will serve as a “one stop shop” for information related to aflatoxins. On the margins of the ECOWAS workshop in Accra, Ghana (see page 1), PACA convened a meeting of experts to develop methodology to successfully implement an electronic data management system in AU Member States. The e-data management system will be used mainly for promoting public awareness, advocacy and communication on aflatoxin prevalence and risk, promoting regional and intra-regional trade, generating evidence to inform interventions, as well as providing information on early warning systems for aflatoxin outbreaks. This system will be hosted by the current Animal Resource Information System (ARIS II) of the African Union Inter-Africa Bureau for Animal Resources (AU-IBAR). ARIS II is a decentralized information management system which enables AU member states to be self-sufficient in standardized and swift information flow at all levels. ARIS II allows for different modules to be built (i.e., an aflatoxin module) and fed information. This information will come from existing structures at country and regional levels as well as relevant organizations. Information is gathered and fed into the system at all levels from the farm, district, province, nation as well as regional and others. The Common Market of Eastern and Southern Africa (COMESA), in collaboration with the Partnership for Aflatoxin Control in Africa (PACA) of the African Union, U.S. Agency for International Development (USAID), and other institutions, is organizing a regional workshop on the aflatoxin challenge in Eastern and Southern Africa. The workshop’s main objectives will be to sensitize key stakeholders on the aflatoxin challenge in the region, to assess current efforts to mitigate aflatoxins, as well as setting regional priorities. This will enable COMESA countries to develop regional action plans on aflatoxin control to further strengthen regional and intra-regional trade as well as protect human health. The workshop will be held in Lilongwe, Malawi from 11-13 March 2014. 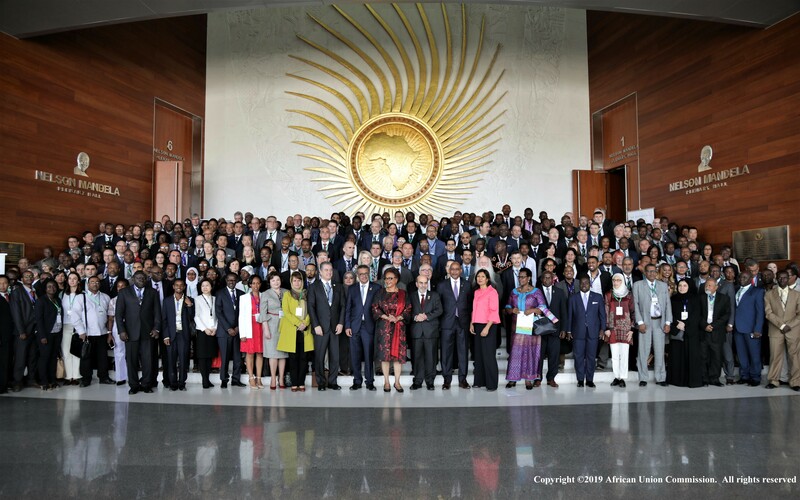 The African Union Commission through the Partnership for Aflatoxin Control in Africa (PACA) is working to improve the effectiveness and efficiency of Governments to tackle the aflatoxin challenge in Africa. The PACA Secretariat, housed at the AUC’s Department for Rural Economy and Agriculture (DREA), is working closely with Regional Economic Communities (RECs) and local country stakeholders through country aflatoxin Steering Committees to support the preparation, execution, and oversight of country government‐led, and stakeholder aligned plans. PACA and the Republic of Uganda convened a Business Meeting of stakeholders to agree on the funding strategy and implementation road map that will ensure sustainable and predictable funding for implementing the aflatoxin control action plan in the country. The Business Meeting took place in Kampala, Uganda on 28-29 July 2016. H.E. Tumusiime Rhoda Peace, AUC’s Commissioner for Rural Economy and Agriculture opened the business meeting by assuring the Republic of Uganda, of the AUC’s commitment to support implementation of the aflatoxin control action plan, which will contribute to the agenda to regain its markets, people’s health and food security. She commended the progress made by the Republic of Uganda in institutionalizing PACA in its farming systems through the Comprehensive Africa Agriculture Development Program (CAADP). Commissioner Tumusiime also officially launched the Uganda Mycotoxin Mitigation Steering Committee (UMMSC) which provides conceptual, strategic and policy guidance to the secretariat and Aflatoxin Technical Working Group (ATWG) – the Uganda Chapter, in the planning, implementation and coordination of mycotoxin mitigation activities in the country. Hon. Ssempijja Vincent Bamulangaki Minister of Agriculture, Animal Industry and Fisheries, Uganda, represented by Ag. Director of extension services, Mrs. Beatrice Byarugaba, committed to incorporate the aflatoxins mitigation under the Ministry’s Agriculture Sector Strategic Plan and to also take into account the multi-disciplinary roles of agriculture, health and trade ministries in fighting aflatoxins. Hon. Bamulangaki noted that without mitigating aflatoxins, it would be difficult to fully develop the fisheries, animal and crop sub-sectors in the country. Dr. Patrick Tusiime, Commissioner, National Disease Control, representing the Ministry of Health, assured the meeting of the Ministry’s support in advancing interventions that address the impact of Aflatoxins particularly within the preventative context of disease management, noting that a healthy nation is a productive nation! For more information, please review the Press Release.